Same-Day Service; Walk-In or By Appt. With thousands of satisfied clients and decades of hands-on experience, Budget Muffler Brake & Automotive is San Diego's best choice for catalytic converter installation, repair, and replacement services. While a dealer might insist on replacing your entire exhaust system if your catalytic converter is bad; we'll recommend only replacing those specific parts of your system that are causing the problem, saving you a significant amount of money in the process. 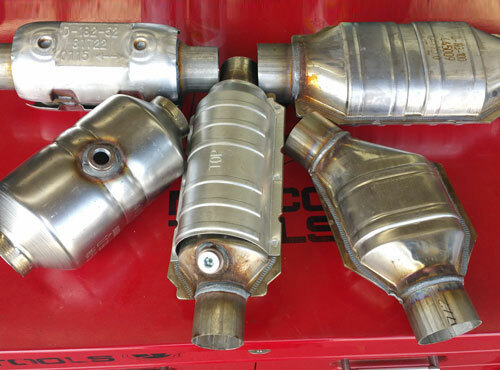 We carry over 80% of the catalytic converters our clients need, which means that we have one of the biggest catalytic converter inventories in San Diego. Our inventory includes high-performance, aftermarket parts from MagnaFlow, Walker, Catco, Hastings, and Miller as well as original equipment parts. At Budget Muffler Brake & Automotive, we perform highly reliable catalytic converter repairs using the latest diagnostic equipment and repair tools. Additionally, our ASE-certified technicians average 20 years of experience working on all types of cars and have put in over 10,000 catalytic converters. Because of our broad level of expertise, excellent reputation, timely service, and diverse selection of parts, San Diego customers go out of their way to visit our shop when they are experiencing possible catalytic converter issues. In fact, we routinely have customers who drive from all reaches of San Diego, including Chula Vista, La Mesa, and National City, when they seek an accurate diagnosis and high-quality, affordable catalytic converter repair and replacement services. Signs that your car might have issues with its catalytic converter include hearing rattling or roaring noises or seeing your check engine light come on. As part of our thorough diagnostic check, we'll inspect the catalytic converter's substrate and efficiency, as well as check for a plugged exhaust system. For catalytic converter installations, repairs, and replacement, call Budget Muffler Brakes and Automotive today to schedule an appointment or simply walk in to our shop. We're able to complete most jobs in less than a day -- often in less than an hour. We have a comfortable waiting room, and our auto repair shop is conveniently located near multiple smog check stations. I've been to this shop twice and received the great customer service on both occasions. Mike and his staff are very knowledgeable and professional. I first took my 2000 Honda Civic due to an exhaust pipe rotted out. It was producing a bad noise and it was leaking a lot . . .